Here is a simply topology as per the CCIE RS material provided by INE. 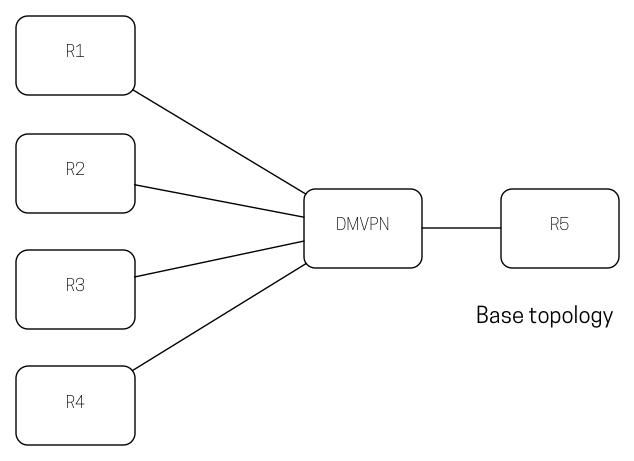 The DMVPN network is used a lot within the many examples and demonstrations to learn technologies due to the hub-spoke nature of the topology. This allows learners to understand the nuances of routing protocols and technologies on different network topologies. The above shows the connectivity via the topology diagram. Below shows how I have recreated it in Cisco VIRL. The configuration for the routers are below. Simple EIGRP configuration with a rotating key that will allow the update of KEY_ROTATION’s key chain on New Years Day 2030. This will occur due to Key 10 being sent for five minutes past midnight, accepted up to fifteen minutes afterward all while Key 20 being accepted and sent since midnight. R5 uses the EIGRP named-mode for configuration. Whilst it is still the same implementation of EIGRP under the hood the configuration is optimised for modern networks and there are some new features. New features like SHA authentication is great. It is clear that the key KEY_ROTATION is the same for all routers. It has the same two strings and the same send and accept lifetime. The only difference is that under an address-family interface on R5 the key mode and chain is applied. So it is four minutes past midnight. What we should expect to see is Key 10 being valid on both send and accept times. So lets validate that the key chain is being used. key 10 -- text "CISCO10"
key 20 -- text "CISCO20"
Time to check the EIGRP hello packets to verify which key is being sent. Note the Hello packets being received here that denote MD5 authentication and key id = 10. This is a good sign. We can also see that this is being received on the interface Tu0 from peer 155.1.0.5. This is our head end router, R5. Now that the send lifetime of key 10 has finished key 20 will now be sending. The send lifetime of Key 10 is no longer valid. That should mean we either have had a successful change over or our neighbors have gone down. Issue a debug of the hello packet again. Very quickly we can see that the peer between R5 and R1 has stepped keys to now accept key id 20. This means that we have successfully rotated keys. Next, validate that the neighbors of R5 have not gone down issue a show eigrp address-family ipv4 100 neighbors command. It is important to note that you require the send lifetime value set to sent a key otherwise a peer relationship will experience retry failures due to the router not sending an authenticated hello. Note the output. It indicate the four neighbors of R5 have been up for over 9 hours. The key has changed from key10 to key 20 without the flapping of neighbors. Wher did you get the Cisco VIRL from? I’m trying desperately to obtain a copy, are you able to assist with this? I got VIRL through and extended field trial from Cisco. I believe something is happening very soon!